"Roy’s skillful blending–of fact and fiction, of personal and political, and of suspense and reward–creates a rich and layered read. But the modern resonances of rising nationalism, in India and beyond, ensure that Roy’s story of what happened in Muntazir transcends its own pages. “Once the letter was read,” Myshkin says, “it would be over and I would have to start waiting again.” It’s a feeling readers may well share." "Taking in the second world war, the fight for Indian independence and occasionally fast-forwarding into the 1990s, All the Lives We Never Lived is ultimately both a work of beautifully realised history and personal narrative. The cover blurb tells us that Roy is ‘one of India’s greatest living authors’. On this evidence it’s hard to disagree"
"a writer of great subtlety and intelligence...a beautifully written and compelling story of how families fall apart and of what remains in the aftermath"
"An astonishing new novel... A writer of extreme brilliance, humanity and grace"
"An extraordinary writer with many gifts"
"This questioning and subtle book, which ranges through freedom, nationalism and ecology, but is really a meditation on history itself. ... The scope of All the Lives We Never Lived is vast but also personal, both in temporal and geographical terms. It manages to retain a closely observed and restrained tone without omitting all of the outside factors that shape a person"
"a novel that comes but rarely in our day and age...global in its appeal and yet Indian at its heart, there is never a dull moment ... a once-in-a-lifetime novel"
"Haunting, elegiac... with elements of the fantastical yet believable sense of magic realism that permeates the finest Indian literature from Salman Rushdie through to Vikram Chandra"
"At its heart, All the Lives We Never Lived discusses complex emotions such as war, nationalism, freedom, love, abandonment, loneliness and nostalgia, with Anuradha Roy unveiling each of these with the expertise of a surgeon ... The world that rewards men for their public actions and forgives them their private cruelties, placing national politics above gender politics, is one that Roy slices through in her prose, though always obliquely"
"A devastating story of love and loss...a brilliant book about human relationships, and a particular time in the history of India woven together in a book of blinding perception and compassion for the human condition"
"The prose is flawless and touching... this is a story about loss and longing and it is a story very finely told"
"Roy’s writing is full of nuance – there is nothing didactic about the way she tackles the grand themes that pit the personal against the political . . . complex characters are conveyed in simple prose. She shows the tragic fallout of the decisions they make while not detracting from their humanity"
"reinvents the idea and act of freedom during the colonial struggle for independence"
"Affecting tale of flawed characters and the constraints they struggle against - and amid the atmospheric historical detailing, there are pin-sharp modern resonances with modern India's nationalism and punishing patriarchy"
"Anuradha Roy has crafted the perfect novel on one woman’s search for freedom... [she] is a novelist at the peak of her prowess, and in this novel there is little she does wrong"
"A love letter to writing and storytelling, set in the landscape of personal memory and public, political history"
"a brilliantly crafted novel ... that piques the reader's interest with every turn of the page"
"Lyrical, subtle, [and] finely observant... A novel of history, both global and personal, gracefully wrought." "This novel has an epic feel but also portrays the feelings of an abandoned child and captured woman while strongly evoking the sounds, scents, plants, people, and social structures of India at the time." "Already published in Britain, the novel has been called 'elegiac,' compelling, and powerful, among other things. Conceived during a time Roy spent in Bali, this is an affecting novel." "Spanning World War II Germany to present-day India, Anuradha Roy's latest novel presents a powerful portrayal of love as a son goes in search of the truth about his mother." "Historical details make this work truly shine, and readers will become deeply invested in the Rozario family." "A sweeping novel set against the backdrops of the Second World War and India’s struggle for independence, All the Lives We Never Lived narrows in on a son’s quest to make sense of his mother’s choices. Weaving in both fictional and historically accurate characters, the book highlights the impact of imperial powers, as well as the oppression that dictated women’s lives in the early part of the 20th century." 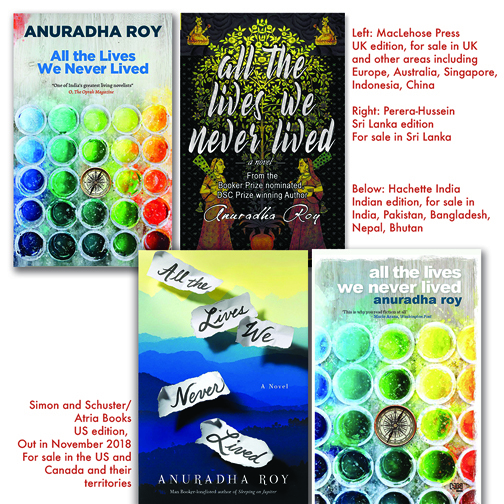 "Roy zeroes in on small moments of connection, showing how even in the midst of great national upheaval, it's those moments that ultimately prove the most profound... Anuradha Roy's All the Lives We Never Lived paints a thoughtful portrait of family and freedom in the midst of the political upheaval of the Indian independence movement." "Emotional and lyrical, [All The Lives We Never Lived] explores themes of family, identity, and regret." "A powerful family story set in postwar India, about a mother who leaves her family to pursue her artistic passions, and a son who tries to understand her choice." "A sweeping new novel that will transport you to India during World War II and back again, as a son starts a journey to find out the truth about his mother, a rebellious artist who abandoned motherhood and her marriage to live a life of freedom. As he uncovers a series of gut-wrenching, uncomfortable, and emotional revelations, All the Lives We Never Lived proves time and time again that Roy is a master storyteller." "The themes of freedom and revolution echo through the book as an older gentleman pieces together childhood memories of his artistic mother as he tries to understand why she abandoned him so many years ago. Set in the 1980s, his tale reaches back to India’s fomenting pre-revolutionary era that led up to World War II, and the insights and lessons ring just as true today." "[A] perceptive new novel... [from] a thoughtful writer who creates beguiling scenes... An affecting tale of loss, remarriage and rediscovery." "Roy, a Man Booker Prize nominated novelist, creates yet another brilliant family saga, set against the vivid background of her home country, India." "Set aside some time during the holidays to read this beautifully written novel about culture, identity, and family." ‘In my childhood, I was known as the boy whose mother had run off with an Englishman’ – so begins the story of Myshkin and his mother, Gayatri, who is driven to rebel against tradition and follow her artist’s instinct for freedom. Freedom of a different kind is in the air across India. The fight against British rule is reaching a critical turn. The Nazis have come to power in Germany. At this point of crisis, two strangers arrive in Gayatri’s town, opening up to her the vision of other possible lives. What took Myshkin’s mother from India to Dutch-held Bali in the 1930s, ripping a knife through his comfortingly familiar universe? Excavating the roots of the world in which he was abandoned, Myshkin comes to understand the connections between the anguish at home and a war-torn universe overtaken by patriotism. Anuradha Roy’s deeply moving novel tells the story of men and women trapped in a dangerous era uncannily similar to the present. Its scale is matched by its power as a parable for our times.